A quick photo of the installation this morning with another relatively large project completed. 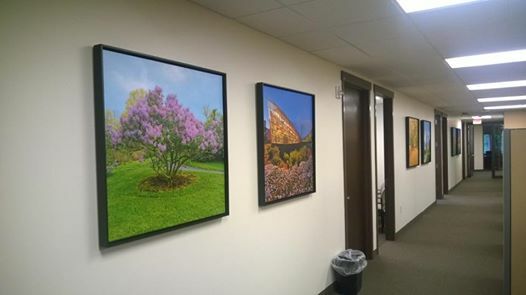 Jason Campbell installed six 36×36-inch canvas photos with float frames at an office in Linden Oaks. I was a bit surprised when the client asked for square perspective, but judicious cropping of my panoramic photos turned out well. Dan Neuberger, long an advocate of square perspective, will enjoy, I am sure. Installations are fun seeing the enjoyment of the office folks watching and commenting! This entry was posted in Sales Success and tagged Canvas, Rochester. Bookmark the permalink.